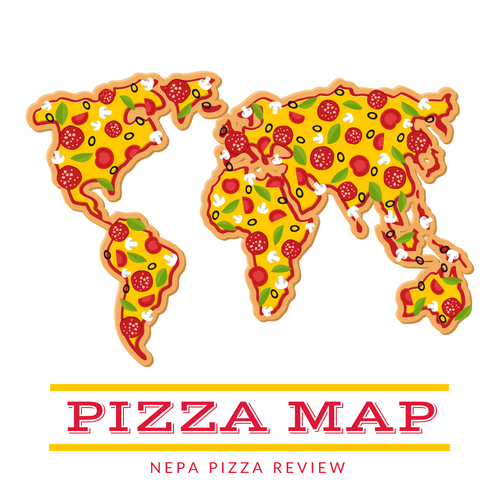 I always take a lot of heat from readers when I review chain restaurants, and I’m sure I’ll get some negative press for this one as well, but there is a method to my madness! Today, I decided to visit the Pizza Hut lunch buffet in Clarks Summit – a place where I’ve visited numerous times since I was eating my free “Book-It” personal pan pizza with a wearing Umbro shorts, a BUM equipment sweatshirt and rocking a mushroom haircut as a kid. Although I have fond childhood memories of Pizza Hut, I have to be honest, I do wonder how this place is still in business because it is almost never busy, but for me that’s a good thing because I know I’ll be getting quick service which moves me in and out the door and on with my day. As soon as I walked in, I noticed something that would make Robert Irvine’s stomach churn. It appeared as if someone set up their office in the dining room and had paperwork spread out on the first table I saw in the front of the dining room. It certainly was not unsanitary, but I’d call this a definite no-no in a restaurant I was running, but at least the table I was seated at was clean and free of debris. On this day, I elected to go with the pizza lunch buffet, even though I hesitated because it wasn’t well stocked up and had a lot of bare space on it, which was unusual because it’s normally full of a variety of pizzas. 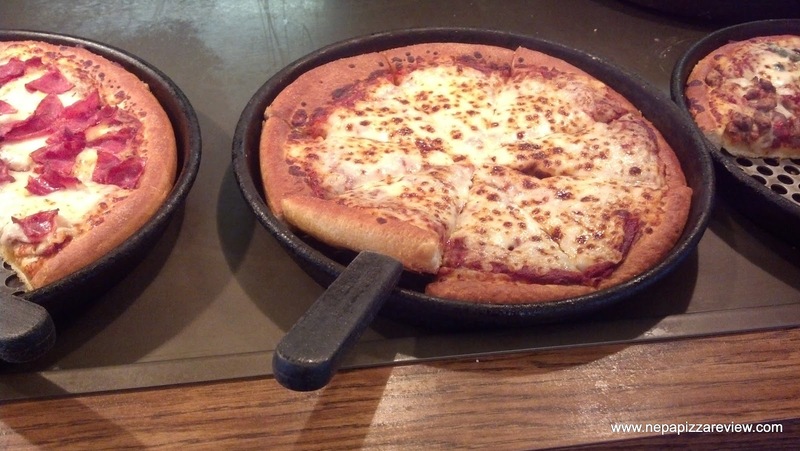 At one point, I noticed only 2 slices of pizza on the entire buffet. On today’s menu there was plain, bacon and sausage, ham, hot wing (at one point), and breadsticks. As sparsely stocked as it was, you can’t really beat the price at $5.95 for all you can eat which includes the salad bar. 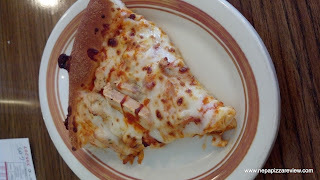 I tried the plain slice first, and noticed that familiar Pizza Hut taste – sweet and bitter sauce which was a bit too pasty for my liking, a greasy crust, and the usual flavorless cheese. Put all together, the taste of the pizza isn’t all that bad, there was nothing that stood out on the plain slice. The crust was not as crispy on the bottom as I’m accustomed to, but it was nice and fluffy and was cooked thoroughly. 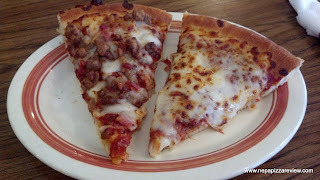 The bacon and sausage slice was much better because the meat provided the flavor and masked the bitter sauce a bit. The bacon was crispy, which I liked, and the meat didn’t add any additional greasiness, which was appreciated. The hot wing pizza was actually pretty good. It had generous chunks of chicken, an appropriate amount of hot sauce that provided a good contrast with the dough and cheese, and overall had a decent flavor. Fortunately, Pizza Hut offered my all-time favorite bread sticks on the buffet. I could eat them all day long, but for my own health I did not over-indulge. I was anxious to try the cinnamon sticks and cherry cobbler pizza that they usually have for desert, but unfortunately they never came out. Overall, the buffet is a good value on most days, when it’s well stocked and you are looking for something different for lunch. At the end of the day, I only paid six bucks and left with a very full belly, and I think that’s all that Pizza Hut is trying to accomplish here. Their pizza has never wowed me, except when I got done reading my tenth “Book-It” book and got my free personal pan pizza! Anyway, the strength of this deal is the speedy service, unlimited pizza, salad, and breadsticks, and strong value, so for those reasons I do recommend the Pizza Hut lunch buffet, but I can’t give the pizza itself very high marks as it's the same old standard pie from decades ago.